LONG BEACH — The first thing followers and fellow competitors want to know about Long Beach Yacht Club’s 49th Congressional Cup: Is the Brit coming back? Indeed, Ian Williams of Great Britain, still ranked Number 1 in the world, will return April 9-13 with his GAC Pindar team in a quest for an unprecedented third consecutive victory in the prestigious Grade 1 match racing event. The first two launched seasons leading to his third and fourth championships on the Alpari World Match Racing Tour (the Congressional Cup is not a part of the tour). If Williams wins again, Long Beach YC already knows the size for his Crimson Blazer, the winner’s traditional prize that goes with the check for the largest share of the $60,000 purse. His rivals will include two former winners — the U.S.’s Ed Baird (2004), currently unranked by the International Sailing Federation (IASF); and France’s Mathieu Richard (2007), ranked 18th in the world — and five other skippers in the IASF’s top 20: Laurie Jury, New Zealand, No. 7; Taylor Canfield, U.S. Virgin Islands, No. 8; Eric Monnin, Switzerland, No. 13; Simone Ferrarese, Italy, No. 15, and Jordan Reece, Australia, No. 16; plus Adam Minoprio, New Zealand, No. 217. Baird, 54, is unranked because his recent match racing has been limited to America’s Cups, and the rankings are calculated by accumulated scores of the best four results in each of the most recent two years. Although he drove Switzerland’s Alinghi to victory at Valencia in 2007, the America’s Cup doesn’t count in the world rankings — but Baird was recognized by IASF as World Sailor of the Year. Minoprio won the Alpari World Tour title in 2009, but he has raced in only three events the last two years while sailing with Emirates Team New Zealand in Volvo Ocean Race and America’s Cup campaigns. The 10th Congressional Cup entry will be the winner of the Grade 2 Ficker Cup April 5-7, held just before the Congressional Cup. A favorite is Dustin Durant, ranked No. 31 after winning this month’s Grade 2 Caribbean Nations Cup in Bridgetown, Barbados. But to reach the Congressional Cup, Durant, 25, will have to beat out a field including his 2012 tactician Scott Dickson — a multiple Ficker Cup winner and a frequent Congressional Cup competitor, who will be back on his own boat this year. 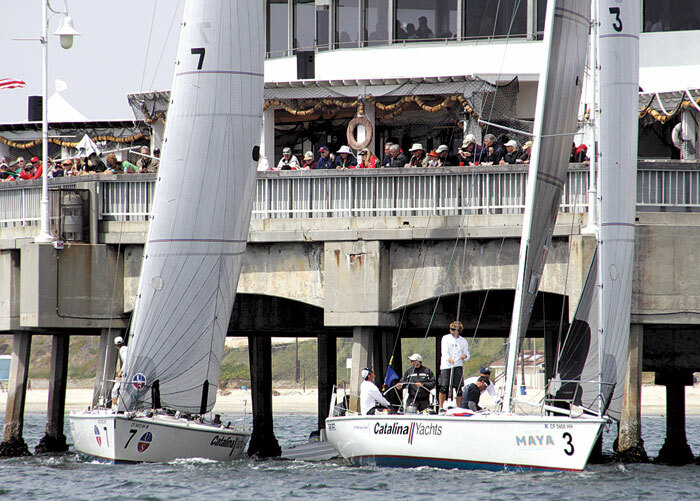 Ficker Cup follows the March 24-25 Butler Cup finale of the statewide California Dreamin’ Series for match racing aspirants. All three events will feature the Long Beach Sailing Foundation’s sturdy Catalina 37s, built for match racing — and all racing will be in front of the Belmont Veterans Memorial Pier, with accommodations for spectators. Admission is free. It’s a familiar place now for Williams, who placed a tough second to four-time winner Gavin Brady in his first Congressional Cup in 2006. Williams, at 35, is the winner of four Match Racing World Tours, including the last two years. Some 20 years later, weary of late-night protest hearings back at the club, then-Long Beach YC Commodore Pete Ives, with input from influential sailing leaders Tom Ehman and Gary Jobson, introduced on-the-water umpiring that revolutionized the game worldwide for competitors and spectators, as far up as the America’s Cup. The Congressional Cup has maintained a high level of organization, with a unique volunteer force of some 300 club members and their families. Each crew is assigned boat hostesses and a housing team to deliver the outstanding local hospitality the Congressional Cup has offered for 49 years.